Undoubtedly, 2018 is the year of big fat Indian weddings. While the craze around Deepika-Ranveer and Priyanka-Nick weddings has not yet subsided, the upcoming wedding of the daughter of the richest Indian billionaire has already caught our imagination about how grand and spectacular it would be. Isha Ambani, daughter of Mukesh Ambani, the Chairman of Reliance Industries Ltd will tie her knot with Anand Piramal, son of Ajay Piramal, a Mumbai-based billionaire industrialist on December 12. 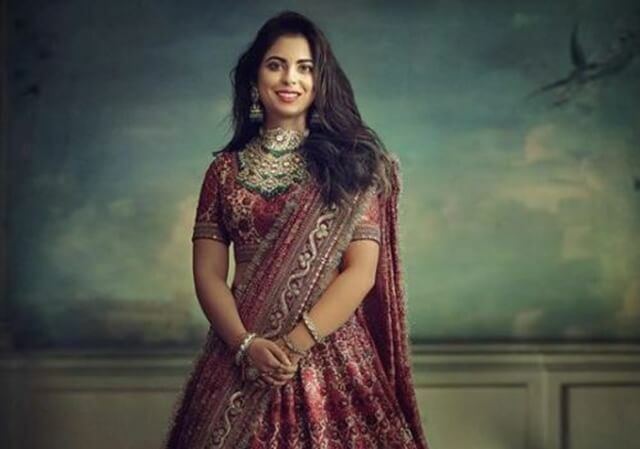 Everything from tens of chartered flights to thousands of luxury cars to booking of five-star hotels to the A1 guest list of biggies to pre-wedding celebrations describes the Isha Ambani wedding as the grandest Indian event of the year. The Isha Ambani-Anand Piramal wedding is to cost nearly $100 million, according to a Livemint news report. Like quintessential Indian wedding, the Isha Ambani wedding schedule was full of dazzling ceremonies and rituals. The pre-wedding celebrations take place at Hotel Udaivilas last weekend in Udaipur, a most beautiful tourist destination in Rajasthan. Needless to say, the wedding of Isha Ambani and Anand Piramal is more magnificent and extravagant than the Priyanka-Nick wedding in Jodhpur. After all, Isha Ambani is daughter of Asia’s richest business tycoon Mukesh Ambani with net worth is $44.3 billion (in 2018, according to Bloomberg Billionaires Index). Isha Ambani, who got an INR 450-crore bungalow as a gift from her in-laws, has had her multi-million-dollar pre-wedding celebrations in The City of Lakes, under the supervision of a leading event management company. Reportedly, pontoons and boats dominated the theme of the setting for pre-wedding ceremonies. An enormous pontoon was set up at one of the banks of Lake Pichola in Udaipur City. Another pontoon for 1,000 guests was set up at the ghat of Hotel Udaivilas. Notably, Isha Ambani’s pre-wedding ceremonies included performances by Priyanka Chopra, American pop sensation Beyonce, and other Bollywood celebs including Shah Rukh Khan in the sangeet ceremony, as reported by India Today and other media. Moreover, local artisans and artistes were roped in to exhibit their craftsmanship and expertise to the guests. An embellished vessel holding a massive idol of Lord Shrinath Ji, a most revered deity for the Ambanis was the center of attraction during the pre-wedding ceremonies by the Lake Pichola. A group of professional dancers performed on the makeshift stage of floating pontoons and flat-bottomed boats on the lake. A spectacular aarti of the deity was performed to seek divine blessings in rhyme with the traditional culture of India. According to Indian media reports, the Ambanis’ guests from the world over were flown to the venue on about 50 chartered flights from Udaipur’s Maharana Pratap Airport, which is a short flight away from Delhi Indira Gandhi International Airport. Generally, only 19 commercial flights take off from and land at Udaipur City Airport on ordinary days. The Ambanis’ guests and those having worked tirelessly to organize Isha Ambani’s pre-wedding festivities were accommodated at five-star hotels in Udaipur City. One of the most surprising facts about the Isha Ambani wedding is the invitation card box which is worth Rs. 3 lakh each. The most expensive invitation card in the history of big fat Indian weddings has been sent to the Clintons, John Kerry, Beyonce and likes. Former US President Bill Clinton and former First Lady Hillary Clinton were among the crème de la crème on the guest list of Isha Ambani’s wedding. But, only Hillary Clinton graced the Ambanis with her presence. A score of high-profile NRIs were expected to take flights from the USA to India for the pre-wedding celebrations in the Lake City. The wedding guest list includes who’s who of the business world and Bollywood. The newlywed couple – Priyanka Chopra and Nick Jonas – who are busy hosting their wedding receptions in India made it to the pre-wedding ceremonies in Udaipur. Everyone from the fashion designer to the makeup artist to the photographer for the Isha Ambani wedding is a celebrity. The Ambanis hired celebrity wedding photographer Joseph Radhik who captured candid moments of the Priyanka-Nick wedding at the Umaid Bhawan Palace. Evidently, Joseph Radhik has got the best of the Isha Ambani wedding events for netizens. Celebrity fashion designer Manish Malhotra, who drapes Bollywood divas in his exotic ensembles, worked on everything from Isha Ambani’s wedding outfits to the upholstery at the venue of events. Even the Ambani women take fancy to his creations. Bollywood’s popular makeup artist, Vardan Nayak has been roped in to make Isha a most beautiful bride. Though what Isha Ambani’s pre-wedding ceremonies cost in total, is not yet officially revealed, there is no denying that it was a hundreds-of-million-dollar affair. Beyonce charges $2 million for a private concert. Her performance at the pre-wedding event in Udaipur has definitely added INR 15 crore to the Isha Ambani wedding expenses. The 2-day booking of Hotel Udaivilas cost INR 3.5 crore to India’s richest business honcho, Mukesh Ambani. Each of the chartered flights (about 50) might have added INR 140,000 per hour to the Isha Ambani wedding costs. The grandest Indian wedding of the year will take place at Mukesh Ambani’s residence in Mumbai, Antilia, the world’s most expensive private residential property and the tallest single-family house, on December 12. The Ambanis, along with the guests and the organizing teams flew back to Mumbai from Udaipur on December 9. The Ambanis have already visited the temples of Siddhivinayak, Kedarnath, Badrinath, Tirupati, Guruvayoor, Sri Ramanathaswamy and Ambaji, offering the wedding invitation card at the holy obedience and seeking blessings for the would-be couple. Travel Beats, a subsidiary of Indian Eagle Travel, is a leading Indian American community portal catering latest visa, immigration, passport, aviation and community stories. A trusted travel booking partner of Indians in USA, Indian Eagle has a proven track record in booking cheap business air tickets from USA round the year.